We offer regimental and civilian coats and jackets. Only top quality wool (15% nylon) is used for strength and stability. Each coat is handcrafted and sized to your measurements. 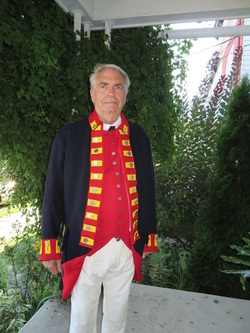 Whether French and Indian or revolutionary war, we can make a coat to your specifications. Superior craftsmanship and durability set our coats apart from the competition. Regimental coats are top lined in linen and skirt lined in wool. The edges are raw and the coat is closed at the chest with hook and eyes. Pewter buttons of your choice, or for your regiment. Lapels can be buttoned one over the other to keep the coat closed. Prices for American regimentals ... $530 (possibly more depending on the specifications of your group). Add $35 if size 50 or over. Prices for British regimentals start at $495 but will vary according to the type of lace needed (if your regiment requires it). Cost of lace plus $30 labor charge. Size 50 and over add $25. Civilian coats can be made of wool, canvas or linen. Lining and buttons of your choice. Various details are available on the collar, cuffs and linings. $425 and up for wool or linen, depending on fabric and trim.......$395 for cotton canvas. If you need to add gold or silver braid or buttons this may also incur an additional charge. Gooch's American Regiment was a regiment of foot recruited in British North America, and put on the British government. They were the first Marines formed in America. This coat is highly detailed with matching waistcoat and breeches. Prices upon request. During the revolutionary war some coats were purchased from French tailors for the soldiers as replacements for their worn uniforms. These coats could only be obtained by lottery, hence "Lottery coats". The color was lt. navy (as opposed to the normal dk. navy) the lapels and collar were tilghman style. The cuffs are slit and the body is slightly shortened. $530. These coats were worn by soldiers who manned the cannons. This coat has worsted wool lace around each button hole, barrel cuffs and red-wool skirt linings. $575 and up. Back detailing for artillery coat. This British officers coat uses the finest red wool and is trimmed in dark navy with gold braid. The tails are in white wool. 42 gold buttons finish the coat. British officers coats are available for all regiments. This coat is priced at $850, other officers coats vary in price according to regimental regulations. 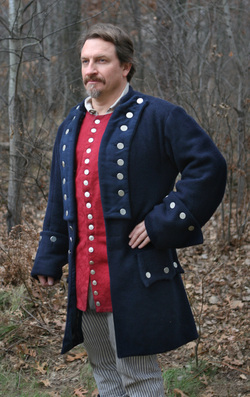 This 1750's coat was custom made for a pirate re-enactor. It features fuller tails, wider sleeves and larger cuffs and shortened lapels. The weskit is longer than usual and has 20 buttons. Stripped trousers complete the outfit. Custom made for a customer, this coat is made of dark navy wool, faced in buff with a buff lining. The buff wool color was set as a standard by John Barry, father of the US Navy. It is elaborately trimmed in metallic gold lace. Eagle buttons supplied by the the customer or sourced buttons would be an extra charge. The westkit is also the same buff color, and also trimmed with the gold lace. Breeches would be a matching buff wool. Naval officer's westkit, gold trimmed.................$250 "
This navy wool coat, weskit and knee breeches were created for a client that portrays John Hancock. The coat is 100% wool and lined in linen. The trim is metallic gold 1/4" and covers the front of the coat forming the buttonholes and trimming the pockets and cuffs. gold plated buttons finish the look. 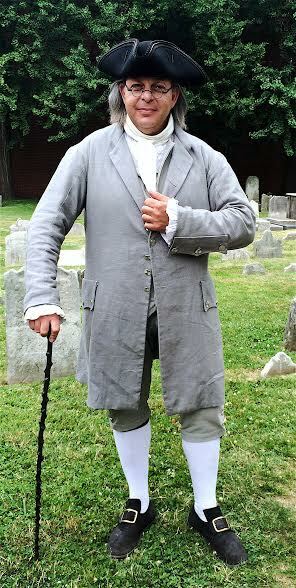 "Hancock was one of Boston's leaders during the crisis that led to the outbreak of the American Revolutionary War in 1775. He served more than two years in the Continental Congress in Philadelphia, and as president of Congress, was the first to sign the Declaration of Independence. Hancock returned to Massachusetts and was elected governor of the Commonwealth, serving in that role for most of his remaining years. He used his influence to ensure that Massachusetts ratified the United States Constitution in 1788." This coat is a civilian style, it buttons over and closes in the front. It is made of a grey linen, with decorative pewter buttons. The westkit and breeches are a slightly lighter grey, and they also have pewter buttons. All the clothing he is wearing have working pockets and are fully lined. General George Washington's regimental coat was of dark blue wool with buff wool facings and gold buttons. His officers wore the same. Carl Closs is a living biographer of George Washington. He travels around the country educating the public about the life of George Washington. We so enjoyed being a part of "The Patriot". Shirts, breeches, coats and full uniforms were made for many of the actors.